We offer a range of teeth whitening solutions here at Timberlea Dental, including Invisalign®. Visit us to learn more. Timberlea Dental has different options for teeth whitening in Fort McMurray. We recognize that each person has distinct whitening needs and requirements. For this reason, we offer a range of whitening options to match diverse needs and budgets. Whether you are seeking teeth whitening in Fort McMurray that is less expensive or one that will deliver the quickest outcomes possible, we certainly have something to suit your requirements. Ask us about Invisalign® options that Dr. Choi is now providing at our clinic. Want effective teeth whitening treatment that you can complete in the comfort of your home? These kinds of treatments are available at drugstores – and perhaps you have tried one or two – but the truth is that a professional kit will give you better results. Contact us to get our at-home whitening program, consisting of a whitening gel and a custom fit whitening tray. The mouth guard is worn with the gel for two 15 minute sessions per day for 10-15 days. Once you’ve achieved your desired result, you can stop using it but you will have your trays for down the road if you would like to continue with whitening. On your visit to Timberlea Dental Clinic, we will take impressions of your teeth so that we can ensure that it fits your mouth perfectly before you go ahead and start whitening at home. As an alternative to take home bleaching trays, we also have in office whitening as an option. We use a Zoom whitening system to help get you same day results. Prior to booking this appointment Dr. Phil Heinzelman or Dr. Ji Won Choi would do a consult with you to discuss whether you are a candidate for this and if there are any reasons that they would have to do a different type of treatment to get you your desired results. If you have stained old fillings on your front teeth, whitening will not change the color of those fillings and at this consult our Dentists will discuss other options for you such as veneers. 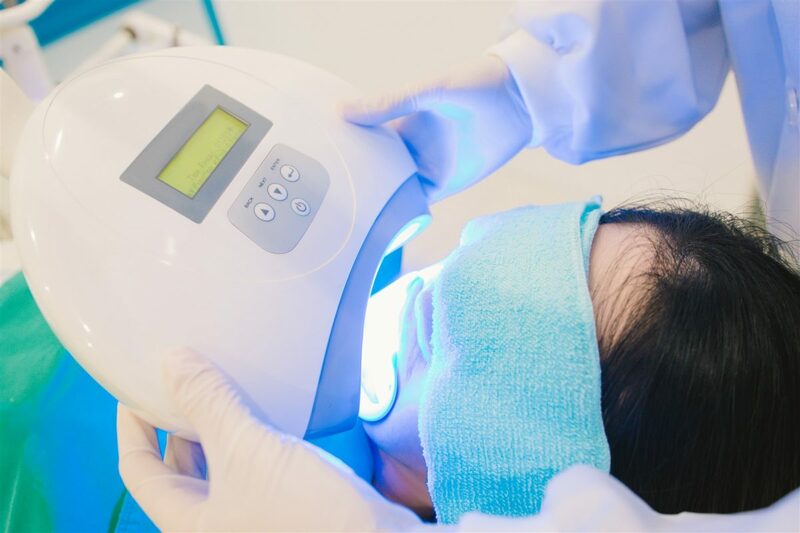 The Zoom whitening appointment is a 2 hour appointment where we apply a solution to your teeth, and we use a UV light that works together with the solution to brighten your teeth. During the two hour appointment, you will have up to four 15 minute sessions with the UV light working on your teeth to lighten the shade. Depending on your specific needs you may need less sessions to get your desired result. To get your teeth whitening in Fort McMurray, contact Timberlea Dental Clinic today! We look forward to meeting with you and providing your dental care needs. Please book an appointment today with one of our dentists here in Fort McMurray. Copyright by Timberlea Dental Clinic 2017. Website by Kastle Media Solutions Inc.